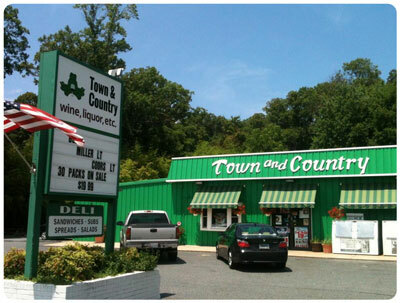 Town and Country – Wine, Liquor, Etc. Town and Country Wine, Liquor, etc. is an “Easton original.” Our convenient St. Michaels Road location has been a serving Talbot County’s beer, wine, and spirits needs for well over 50 years! Our selection is one of the largest anywhere on the mid-shore. You’ll find we’re well-stocked with literally thousands of wines and spirits from around the world and hundreds of craft, import, seasonal, and specialty beers. From single-barrel bourbons to single-quinta ports, single-malt whiskies to vintage champagnes, you’ll find it and so much more, here at Town and Country. Can’t find your favorite? We specialize in special orders here, filling dozens every week. Whether it’s a bottle or two or a case, most special orders take less than seven days. Town and Country delivers great value with real options that are carefully selected to meet a variety of tastes and budgets. From a weeknight pizza or take-out wine, to your entire bar for holidays, parties and weddings, our friendly, approachable staff can make the right recommendation. We pride ourselves on our customer service, but you can feel comfortable browsing Town and Country at your own speed. Stumped? Our knowledgeable and courteous staff can help put you on the right track.